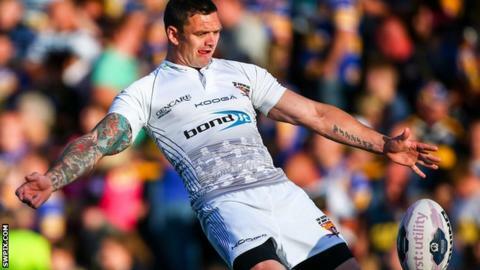 Danny Brough's late drop-goal rescued a point for Huddersfield in a thrilling Super League game against Warrington. The hosts led through Gareth O'Brien's well-taken try, but Chris Bailey, Ukuma Ta'ai and Shaun Lunt helped the Giants to a 19-6 half-time advantage. Jodie Broughton's solo effort stretched their lead after the break. Ryan Atkins reduced the arrears and Ben Harrison touched down twice to put Wolves ahead, only for Brough's last-minute intervention to force a draw. It was a fitting end to an entertaining match, although both teams will feel they could have claimed the win that would have lifted them to second in the table. Warrington had won their last six meetings with Huddersfield in Super League and also beat the Giants in last season's play-offs. After a sustained spell of early pressure, the Wire went ahead when O'Brien dummied his way through for a fifth Super League try of the season, before converting. Bailey responded almost instantly, latching onto Brough's grubber kick to equalise, and Ta'ai burst through from close-range soon after to complete the turnaround. Scotland half-back Brough added the extras both times. Lunt made it three Giants tries in the space of eight first-half minutes, showing great strength to score for the third game running. On the stroke of half-time, Brough kicked a drop-goal to move up to eighth on the all-time list of Super League point-scorers. Broughton made it 23 unanswered points for Huddersfield within four minutes of the restart, running almost the full length of the field to score a brilliant breakaway try, which Brough failed to convert. That miss appeared to be the spark for an incredible Warrington revival, with Atkins scoring his 13th try of the season, touching down after O'Brien's neat grubber, to reduce the deficit to 11 points and keep the contest alive. Harrison turned the game on its head for a second time, twice showing great strength to hustle his way over in the space of five minutes to put Wolves back in front, with O'Brien holding his nerve from the tee. There was a lengthy delay as Rhys Evans received treatment for a head injury, sustained as he came within inches of scoring a fifth Warrington try. But there was still time for late drama as Michael Monaghan's pass was intercepted and Brough opted to kick for goal and settle for a draw. "If you watch the first half, it was a point won. It was great entertainment but it's not one I'm overly proud of as a coach. "We're disappointed with our first half. We weren't far off, but just weren't on it. "We found some energy and some response and ways of speeding the game up. We showed some spirit to fight our way back in and should have managed things better and gone on to win it." "It was a game of two halves. It was all about momentum, we both had it at at times and Warrington definitely came home with it. "The positive is we put ourselves in a big position against a good team. If we want to win this competition, which we do, we'll have to play these again and we do know we can compete against these teams. "The other positive is we haven't lost. It's only a point but it moves us up a couple of places." Warrington: Russell; Ormsby, Atkins, J Monaghan, R Evans; O'Brien, Myler; Hill, M Monaghan, Harrison, Waterhouse, Westwood, Grix. Replacements: Wood, Higham, England, Laithwaite. Huddersfield: Grix; McGillvary, Cudjoe, Murphy, Broughton; Brough, Robinson; Crabtree, Lunt, Kaufusi, Patrick, Lawrence, Bailey. Replacements: Kopczak, Faiumu, Ta'ai, Fairbank.